“How many of you studied intellectual property,” Suzanne Downing, MicroSociety’s Regional Director, asked a room full of Fulbright Scholars. A few started to answer. She finished, “when you were in the third grade?” The room erupted in laughter, and any hands that started to go up quickly shot back down. This was just one bright moment from Friday afternoon when 27 Fulbright Scholars visited Headquarters at Drexel University’s Science Center to learn more about MicroSocietyⓇ and our network of schools. The graduate students represented 20 countries, including Morocco, Latvia, Singapore, Argentina, Russia, Turkmenistan, and Pakistan and brought perspectives from a range of fields, including Middle Eastern studies, chemical engineering, linguistics, social anthropology, nutrition, physics, and higher education. 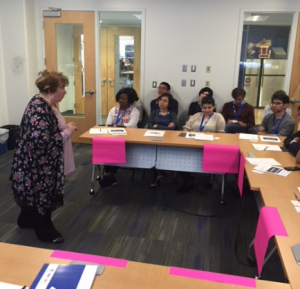 Voice and choice is central to our work,” explained President and CEO Carolynn King-Richmond as she introduced a video of MicroSociety students in action: a CEO, legislator; tellers monitoring bank account balances; and marketing specialists conducting research. It also showed the social and academic improvements of a student with special needs. Downing shared stories of a student-run “naptel” (a hotel where kindergarteners can check in to take naps), zen garden, and meditation classes, all of them particularly exciting to the psychologists and neuroscientists in the group. King-Richmond shared how community partners offer a wealth of from-the-field knowledge to students in local schools and then challenged the visitors to develop ideas for bringing their particular professional expertise into K-12 schools. In small groups, the excitement grew. Students could explore the issue of entitlements and how taxes could support them (policy); simulate a medical emergency and develop solutions (public health); examine qualitative data for social research and foster intergenerational understanding through social projects (social anthropology); and meet with representatives from other schools to forge diplomatic relationships (international relations) while developing a wide range of 21st Century skills, including communication, emotion management, creative persuasion, analysis, adaptability, and leadership.